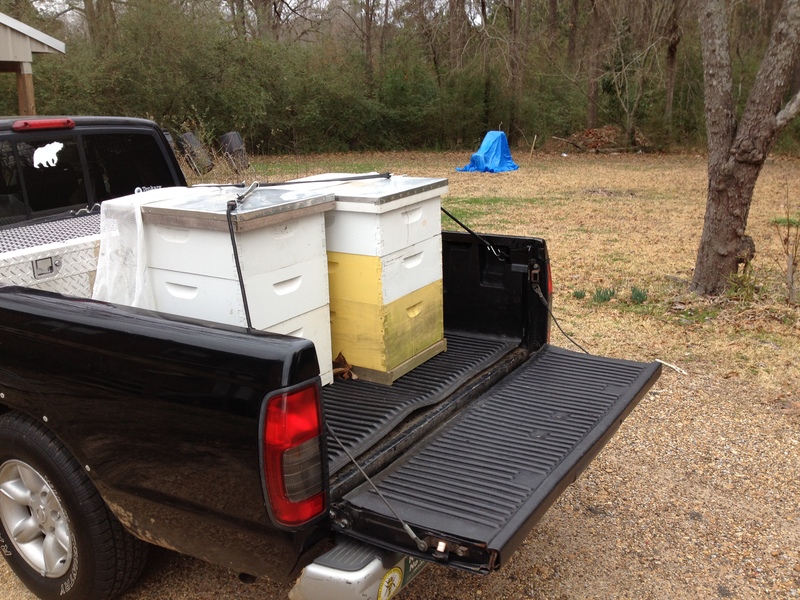 Last weekend, my son Ross and his friend Jonathon helped me move the bees from Lena, MS, to Pelahatchie, MS, where I now reside. It was quite an experience, for sure! And, yes, I did get stung. The bees — naturally enough — preferred not to be disturbed. Regular readers of my blogs and newsletter know that I’ve just moved to Pelahatchie, a little town (pop. 1400) about 30 miles from Lena (pop. 181), where I’ve resided for the past 15 years. It’s really “the big city” for me! There’s a grocery store only one block from my house; my health care provider, Linda, a nurse practitioner, is only two blocks away; and I’m only 30 minutes from my new job in Jackson. It used to take me about an hour and 15 minutes to get to work, each way! So, it’s a lot handier. Of course, this move also spells the demise of ShooFly Farm. Annette and I operated it at Lena for 7 years. But she has now moved to North Carolina, and I’m not up to farming alone. Also, my job is quite exciting — advising and consulting on sustainable, natural and organic farming with the National Center for Appropriate Technology (see: ncat,org). I’m also on the road a lot throughout the Gulf States region (MS, LA, AL, GA, FL), giving workshops and seminars, and speaking to farm groups and universities. First, we all suited up and made our plans. 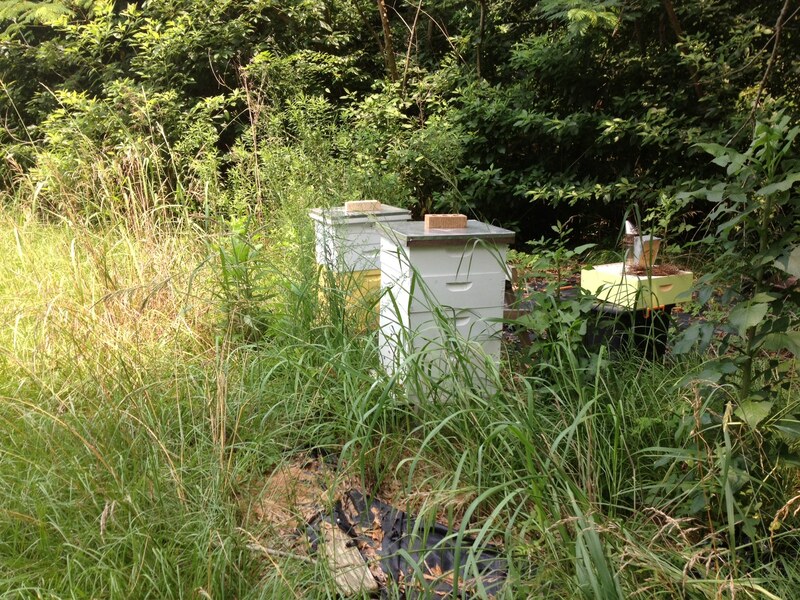 You will notice that I’ve put nets on the hives. Large, commercial beekeepers just pick them up and toss them on the back of a truck, and if they lose a few hundred bees in transit, so be it. But I’m not a large commercial beekeeper. 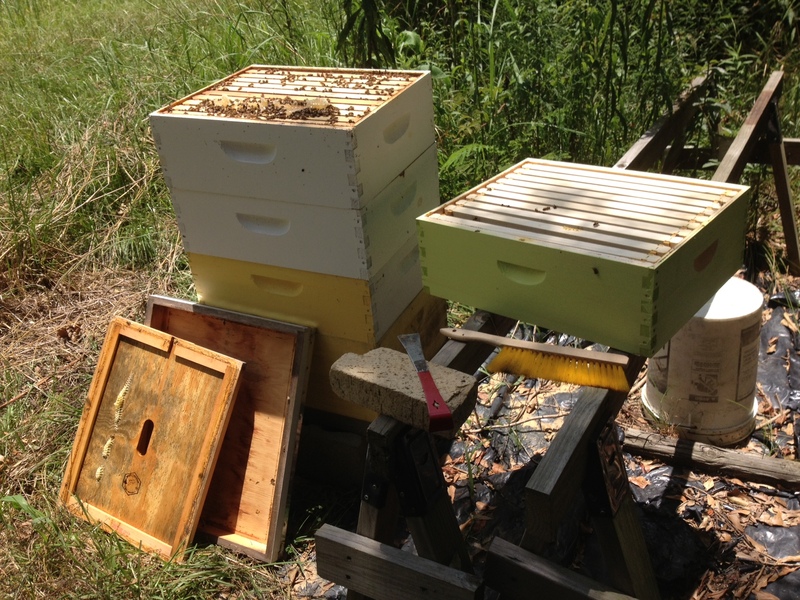 I practice natural beekeeping, and I love my bees. I try to be as gentle as I can with them and minimize mortality. It’s stressful enough moving them, and something I wouldn’t do if I had a choice. 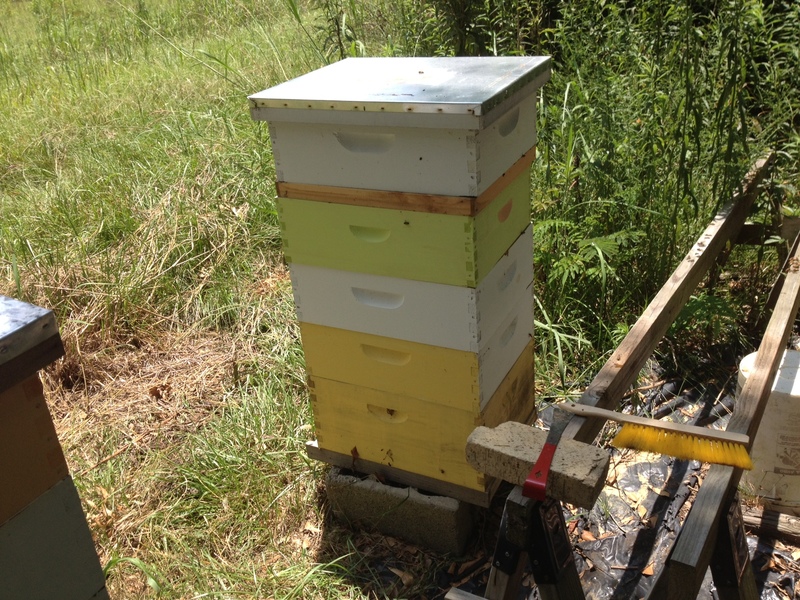 I had tried to move the bees by myself the weekend before, but first, I got my truck stuck, since it had been raining so much, and then, I found that I could not lift the hives. Each weighed about 100 ponds or so. 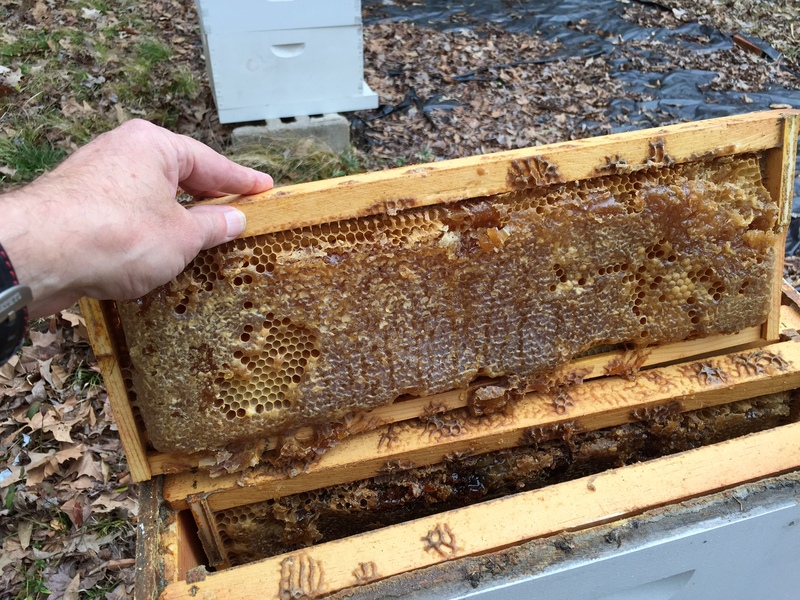 I had thought that since the hives were down to their lowest numbers, it being deep winter, and their honey would just about have been used up, that the weight would be less. I was wrong. 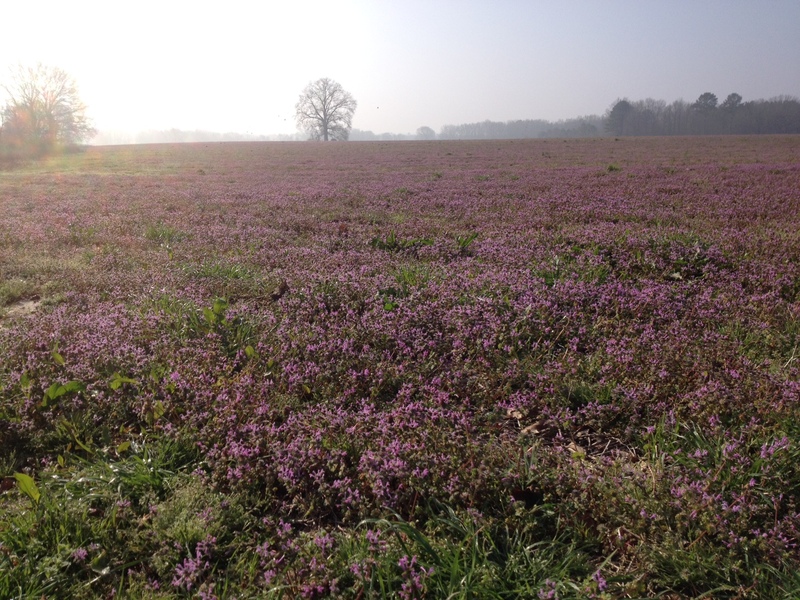 It’s possible that they’ve been obtaining more honey from wildflowers or hen bit, a ground cover which is popping up. I’ll know more in a week or so when I start feeding them. I’m glad I had the young men to help me. 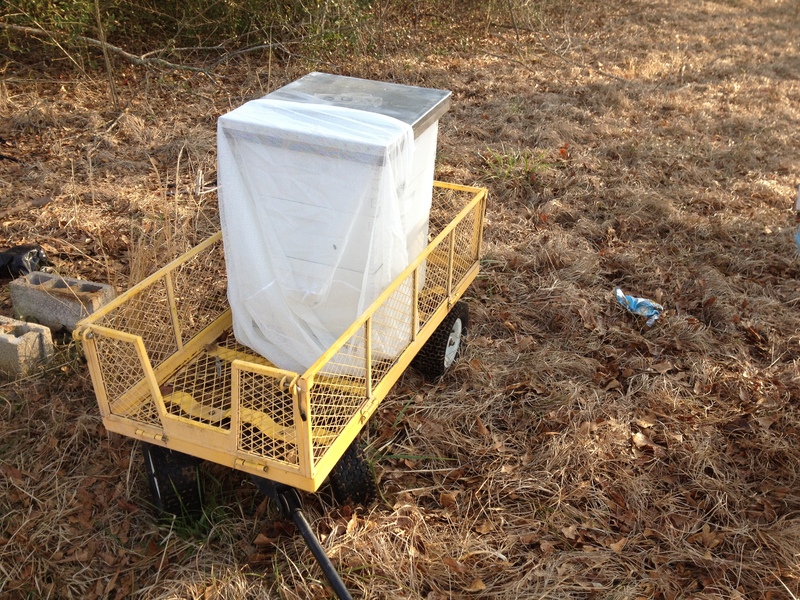 I couldn’t have moved the hives by myself — especially lifting the hives to put them on the cart, then on the truck, then from the truck to the cart, then to their new home. 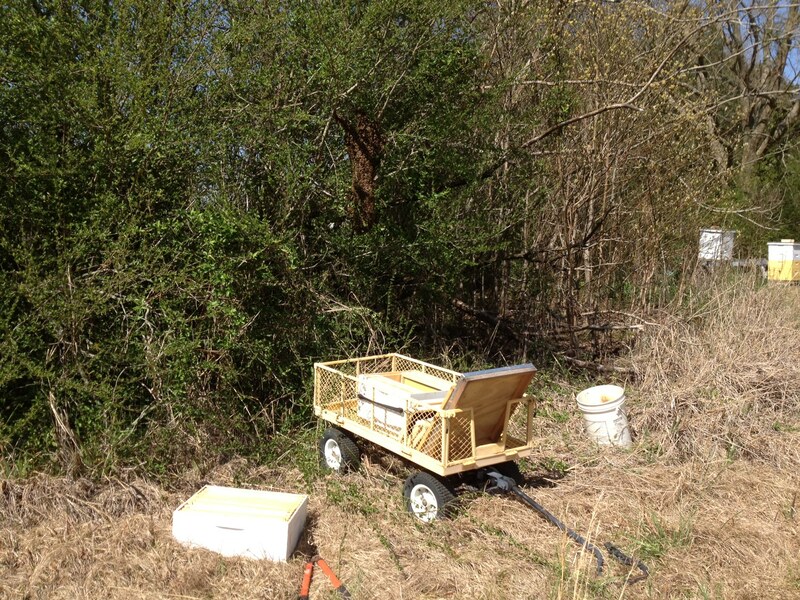 Up until we actually moved them on the truck to their new home, the bees had pretty much stayed in their hives. The temperature was the upper 30s. Generally, bees stay in their hives when the temperature is 48 or below; they stay in the hive and “unhook” their wings, so that they are shoulder to shoulder and “shiver” — as if they were flying — to generate heat to keep the queen and hive warm. This is how they survive even the harshest winters. 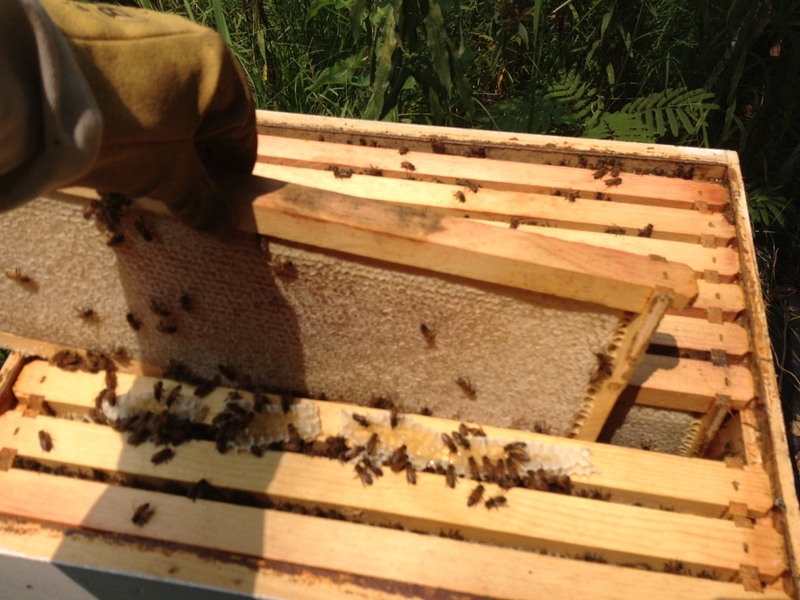 Since it was cold when we started, they didn’t much venture out; except for a few scouts to see what in the heck was going on, and they were held close to the hive by the nets. 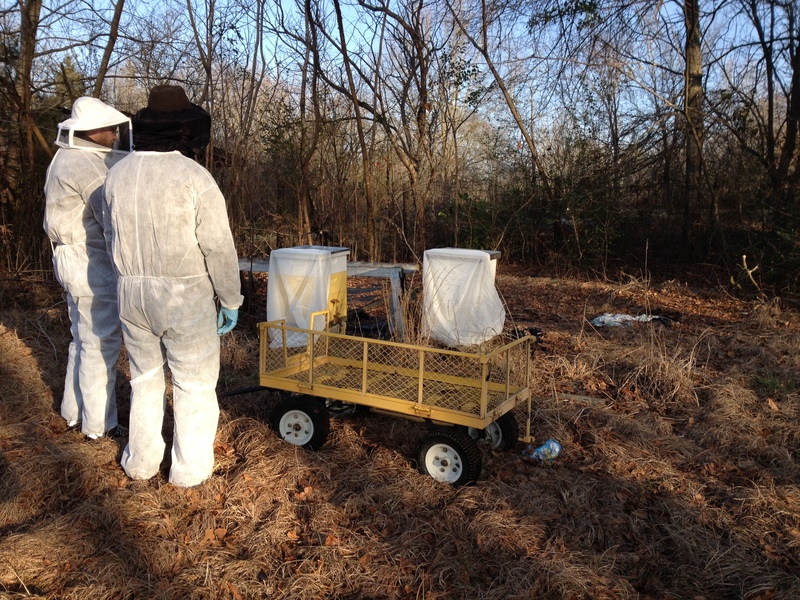 However, by the time we got the hives to Pelahatchie, the sun had warmed the hives and it was in the 50s. 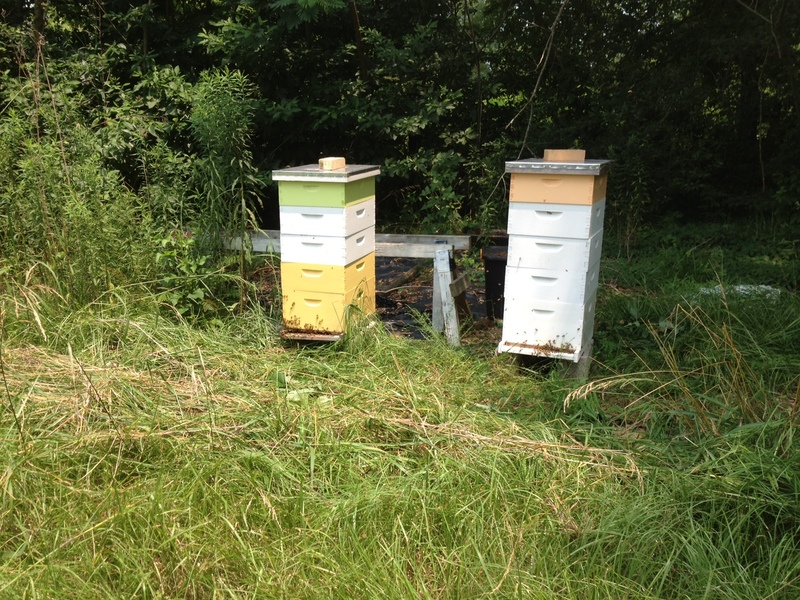 The bees were agitated by the 45 minute drive and upset about being moved. After we placed the hives on concrete blocks at their new home in Pelahatchie, I told Ross and Jonathon to go inside the house. Then, I removed the nets. Those bees and hundreds more of angry bees came out of both hives at that point. I walked away in a calm deliberate manner, which is normally the best way to not getting stung. Even so, I did get stung. One bee got under my veil (bee in my bonnet! 🙂 and stung me on the neck. I always tell people who are thinking about keeping bees and are worried about it: If you are going to mess with bees, you will get stung! There’s no getting around that fact. But it’s also beneficial to one’s health to get stung every once in a while, in my opinion; it’s said that beekeepers have a much lower rate of arthritis than the general population; and “bee therapy” or intentionally getting stung has been around since the time of the ancient Greeks. So, while it did sting, it didn’t bother me that much. Since I was stung on the neck, however, to be safe, I did go inside and take an antihistamine to prevent swelling (bee venom is a histamine). My neck itched for a couple of days, but that was about it. 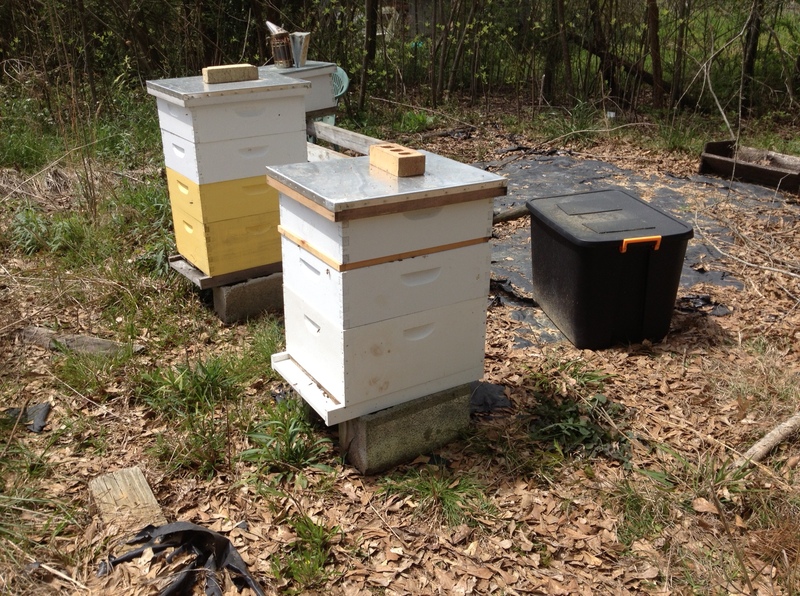 I’ve checked on my bees every day since the move (without cracking open the hives; since that could compromise their internal atmosphere) and they seem to be adjusting nicely. In case you haven’t noticed, Spring is bee swarm season. 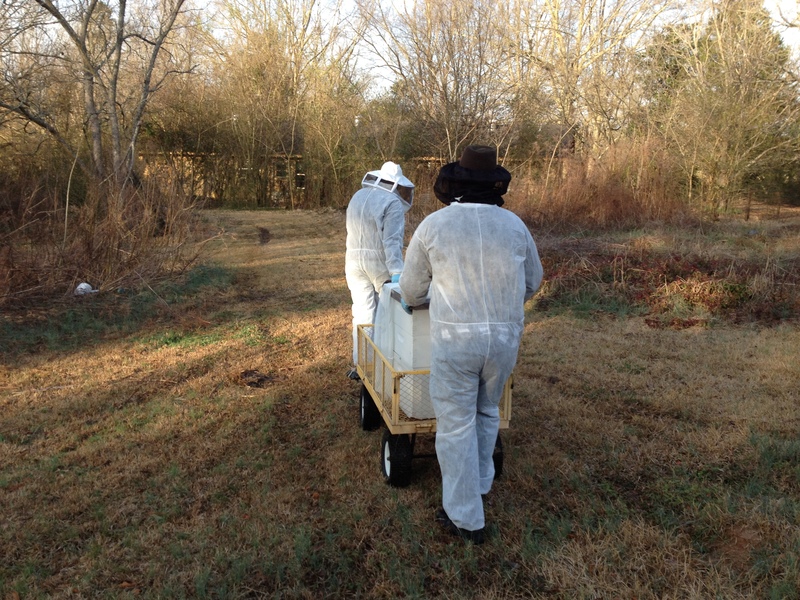 Beekeepers try to keep their bees from swarming (by splitting hives, removing queen cells, requeening, adding supers, etc. ), but it happens anyway. It’s the bees’ way of propagating. Each Spring, the queen accelerates egg laying in preparation for the coming honey flow. When the hive gets crowded, the old queen leaves, taking about half the hive’s members with her. A new queen takes her place. It’s nature’s way. In effect, beekeepers are trying to contain or control nature by retaining their bees, but that’s more of a goal than a certainty. On Monday, I went outside to do some chores and I heard a loud buzzing in the backyard, and I thought: Uh, oh! 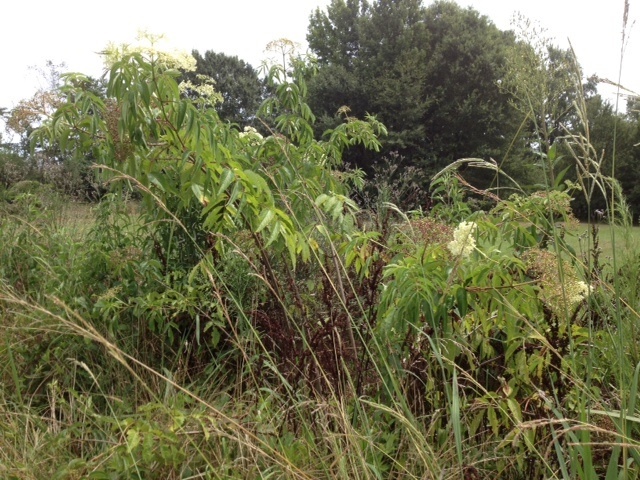 I went out the side field toward the bee yard and the sky was filled with buzzing bees: a swarm! From past experience, I knew there was nothing to be done until they coalesced into a tree. So, I went back inside the house. 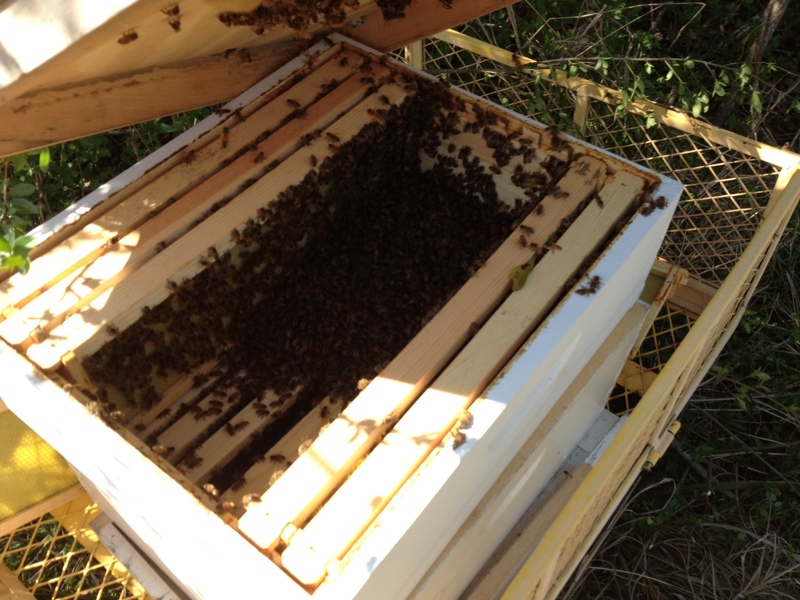 I went and got an empty brood and super boxes and wheeled them out to the swarm. Capturing this swarm was made easy by the fact that it was low to the ground. 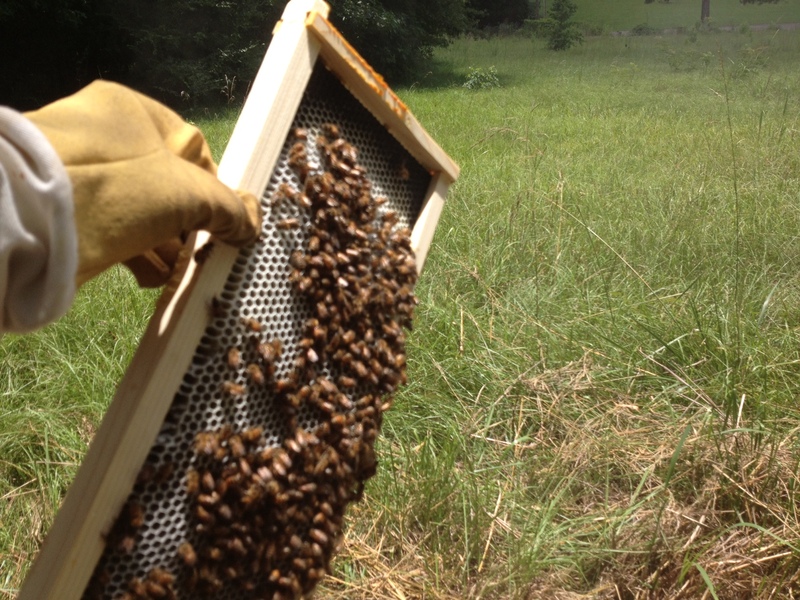 A few years ago, I gave up on a swarm that was high in an oak tree. 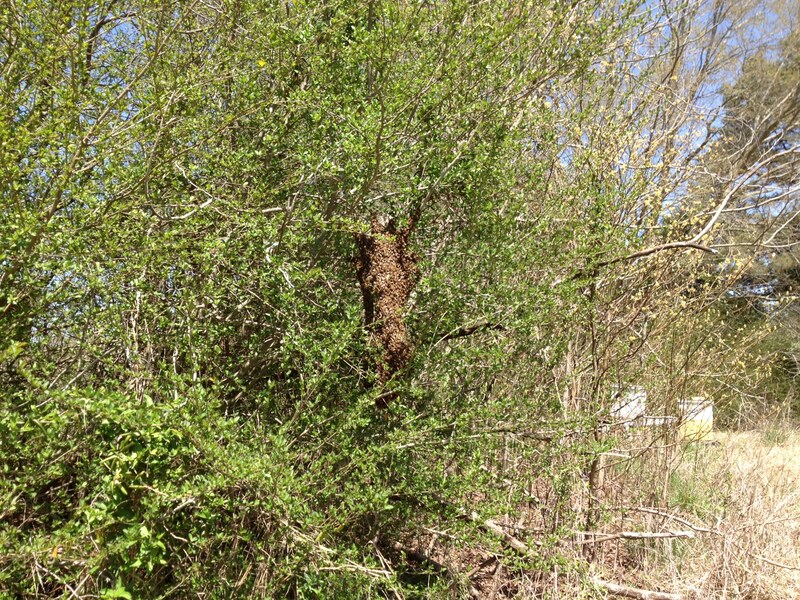 But this swarm posed a problem in that its size was larger than average and it adhered to several branches, rather than one main branch. The key to capturing a swarm is to stay calm and go through every move in your mind beforehand, so that you are practicing effortless effort. Picture it in your mind as a fluid, gentle movement. Sounds rather Zen-like, doesn’t it? That’s true. The bees will respond to your energy, so you want to be calm, cool, deliberate, unhurried. With this swarm, I wheeled my empty hives beneath the swarm, then took my shears and slowly pruned all the branches from around the swam, above, below and to the sides. The bees were very quiet; you could hardly hear them, even as hundreds still zoomed in and out. They were very gentle, as they had no honey to protect; they were balled tightly around their queen, protecting her, awaiting signals from their scouts that a suitable new home had been found. Finally, the moment of truth had arrived. 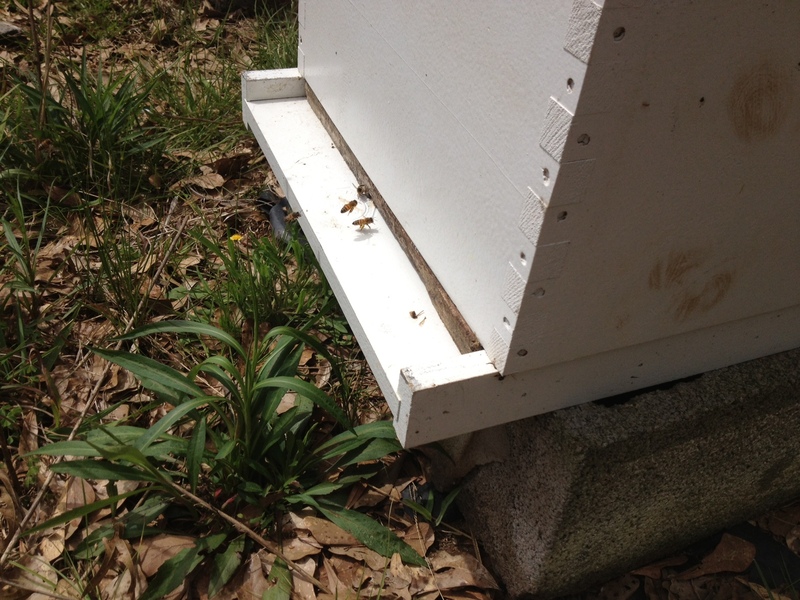 Since the swarm had settled on several branches, I had to cut each one and shake it into the bee box. 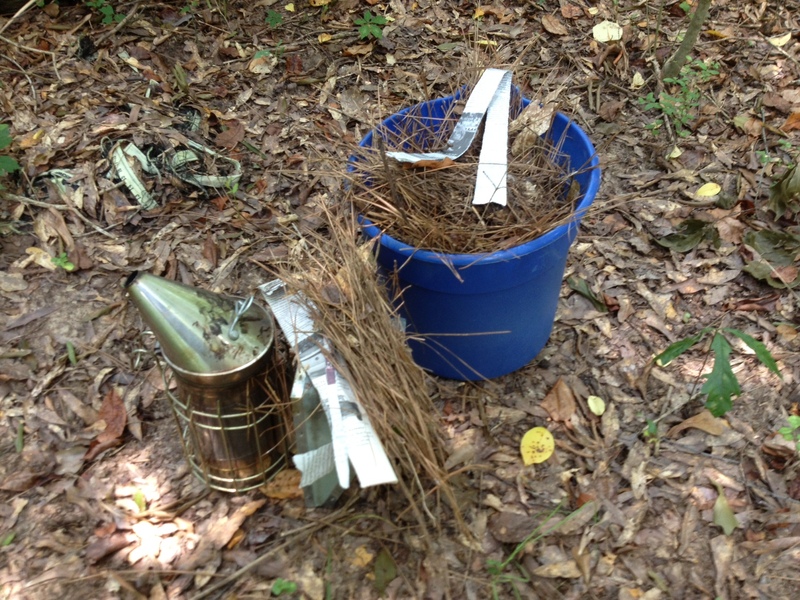 And, as I cut the limbs, hundreds of bees were dislodged. Needless to say, the bees didn’t like this. 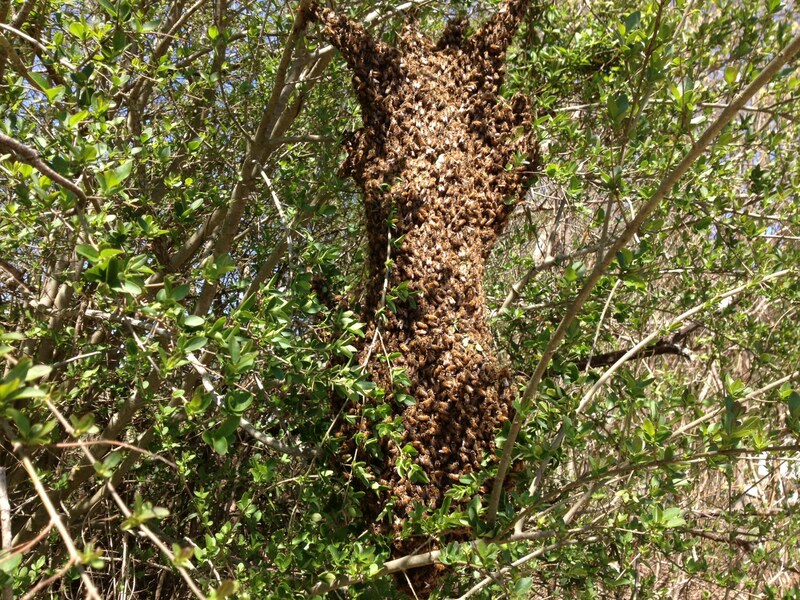 Now, thousands of bees were zooming around — some quite angry! So, I gently closed the box and walked away. About an hour later, I came out to check on the bees. They were settled in their new hive. 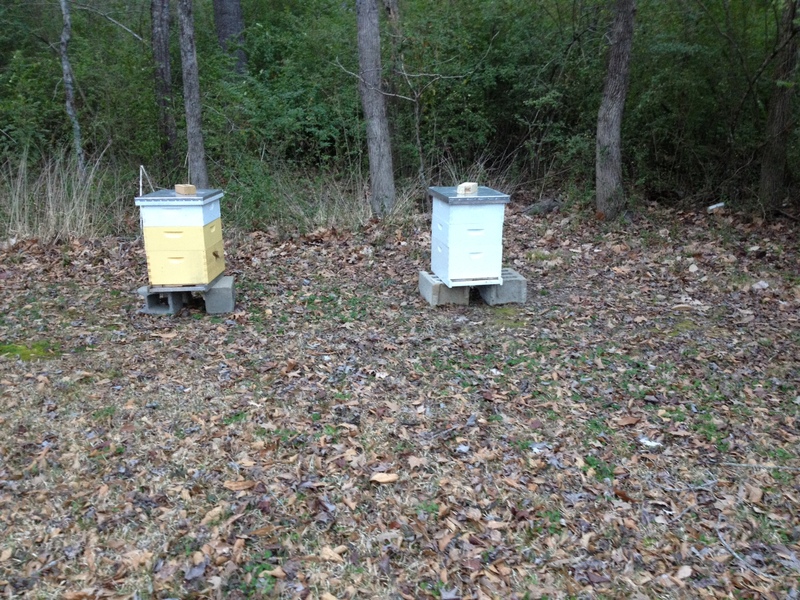 So, I wheeled it to the bee yard and put it on blocks: their new (old) home! We’ll see if they stay. Sometimes they do, sometimes they don’t. You can’t fool Mother Nature! other bee-ings — need water! spot (as in the photo) and spray it with a hose. can lap up the water with their long tongues and carry it back to the hive. with water so that the bees can stand on the rocks and sip. Without somewhere to land, bees can drown. Freshen the water every other day or so until rain provides natural sources. water per day, with 800 workers making trips to water sources 50 times a day. During drought, bees need water. It’s easy to provide it. 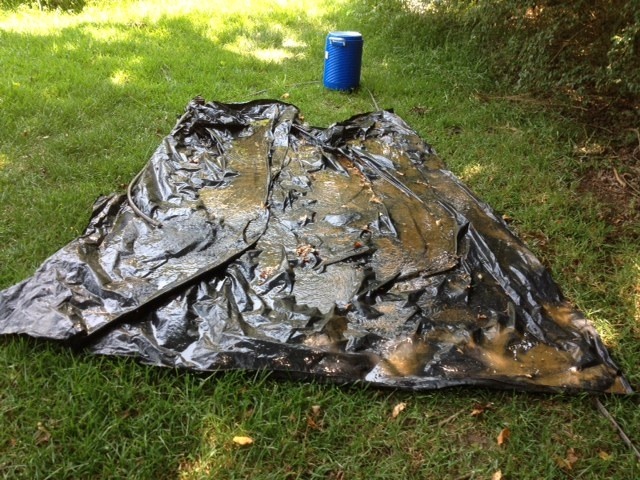 Just throw a piece of plastic in the ground (in shade) and spray it with a garden hose. 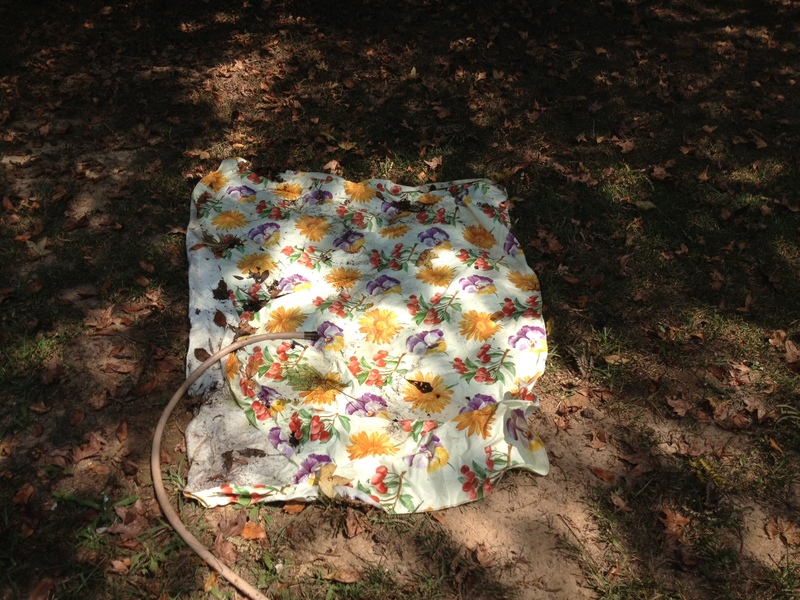 Wrinkles and leaves are good, allowing “landing spots” for bees. Think growing organic food is difficult? If you have a wheelbarrow, garage and driveway, it’s as easy as 1-2-3. 3) During the day, if temps are warm, lightly water or mist the soil and wheel the wheelbarrow to a sunny spot in the driveway; at night, wheel it back into the garage. Within days, you will have plants sprouting, and in about 4-5 weeks, they will be ready to put into your 4-foot-by-8-foot organic “Jim’s plot.” Or, if you keep them pruned, they can produce right there in the wheelbarrow! See, one, two, three. 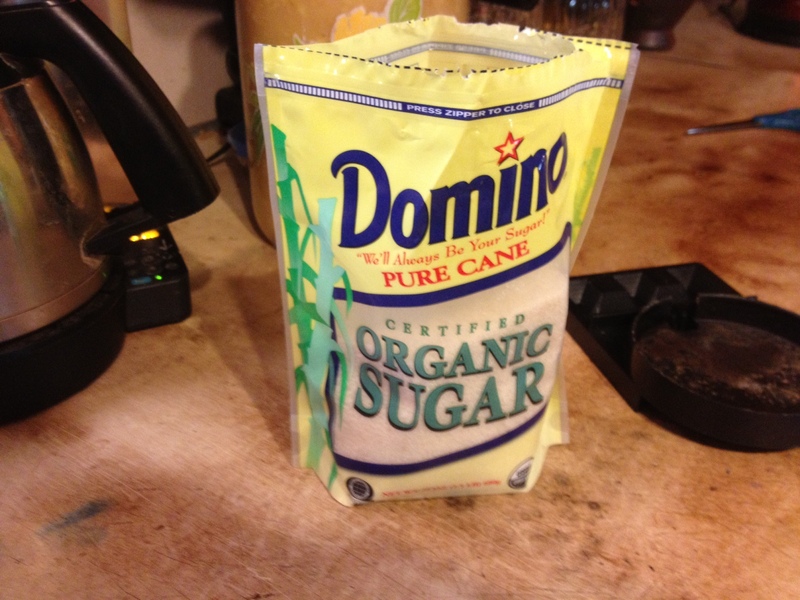 Who says organic gardening is hard to do? First, bees require lots of water and if they don’t have a place to land (such as a leaf) in a pond or other water source, many can drown trying to obtain it. 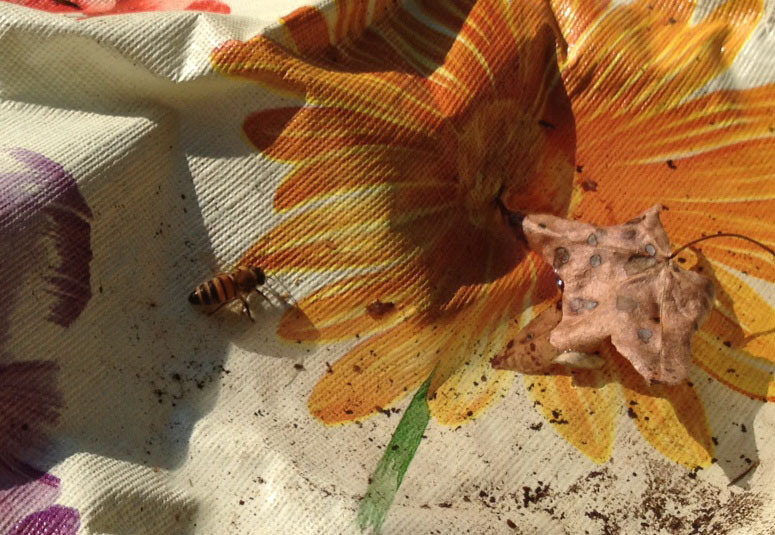 During drought, it’s a good idea to offer bees a water source, and it can be done by putting gravel in a baking pan (in shade) and filling it with water so that the bees can stand on the rocks and sip. Similarly, one can pour a mixture of organic sugar and water in the pan to feed bees (mix sugar into warm, not hot, water until it won’t absorb any more to make the syrup). 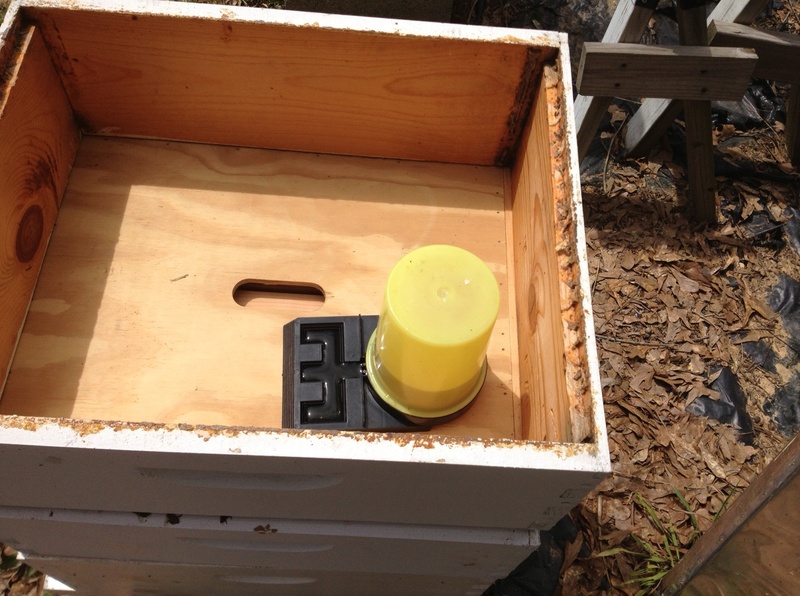 Beekeepers have specially designed feeders for their hives that release sugar water, as needed, by the bees. 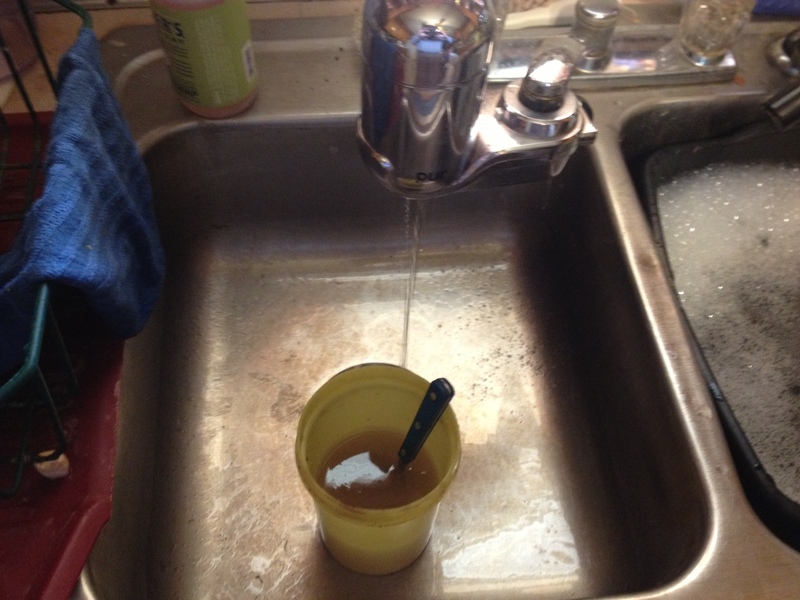 It’s important to keep the sugar water fresh, so it doesn’t spoil, just as you would do with hummingbird feeders. Note: Do NOT give bees honey. While honey is safe for humans, each bee colony has its own viral load of diseases specific to that hive; bees, for example, in natural (or organic) hives without antibiotic treatments by the beekeeper could be killed off by being fed honey from treated bees. 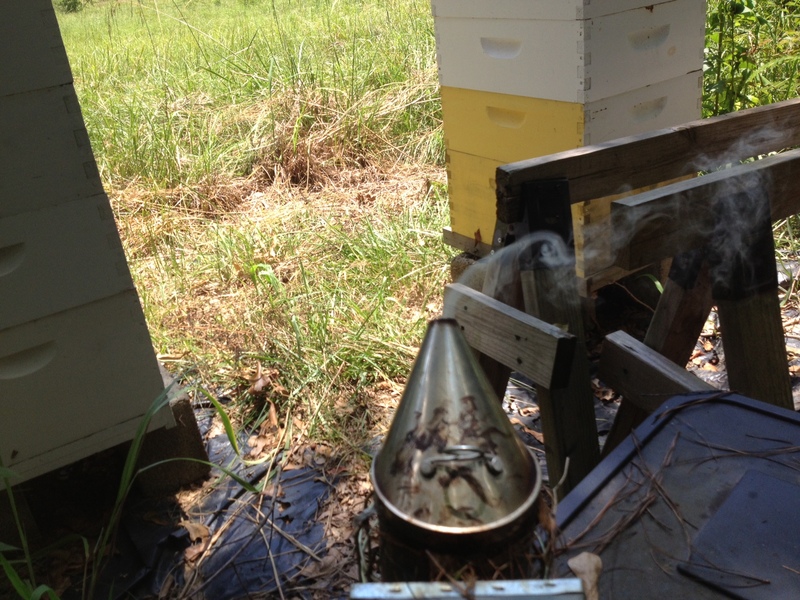 Even “raw” or organic honey can transmit diseases that the bees may not have. Just give them sugar water. Need bees? 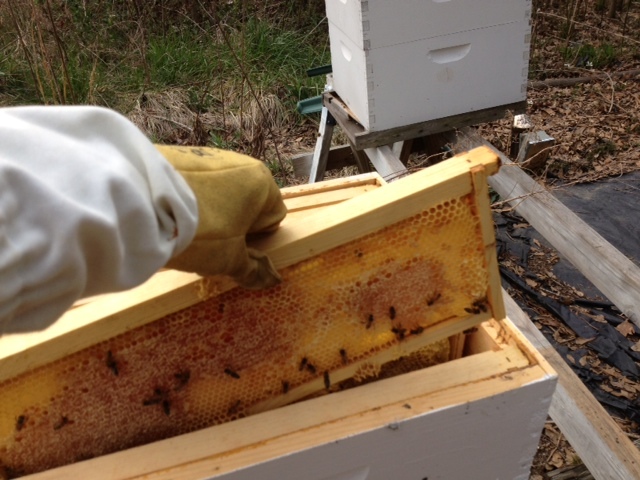 Smart beekeepers order their bees in November for spring delivery. There are still a few beekeepers with bees to sell; one “natural” beekeeper (without chemicals) is Beelicious Honey in Hattiesburg. I saw the owners recently and they have a few orders left. For details, visit http://www.beelicioushoney.com or write info@beelicioushoney.com or call (601) 447-4658. You will have to pick up the bees in person. Aldo Leopold showing at Millsaps: On Tuesday, Millsaps is showing Green Fire: Aldo Leopold and a Land Ethic for Our Time, the first full-length, high-definition documentary film made about the legendary conservationist. Although probably best known as the author of the conservation classic A Sand County Almanac, Leopold is also renowned for his work as an educator, philosopher, forester, ecologist and wilderness advocate. For tickets, call (601) 974-1130. Tickets are also available at the door. Admission is $10. For additional information, visit http://www.aldoleopold. org/greenfire. Ag Day: National “Ag Day” will be observed Thursday at the Mississippi Farmers Market on High Street in Jackson, 10:30 a.m. to 12:30 p.m. Speeches and fresh, locally produced food will be the highlights.